The Journal Junkie: READY OR NOT, HERE WE GO! I have some upcoming exhibiting opportunities that have pushed me along a little faster than I probably would have gone without added motiviation. To get ready, my hubby and I spent the weekend figuring out some "framing" options for some of my work. Focusing on "There are no Rules!" as a way to approach my art, the "framing" is anything but traditional. So far I am using corrugated metal and lathing, nuts, bolts, washers, etc. After 2 trips to Home Depot and a trip to a metal shop, we have a prototype that I can now show. 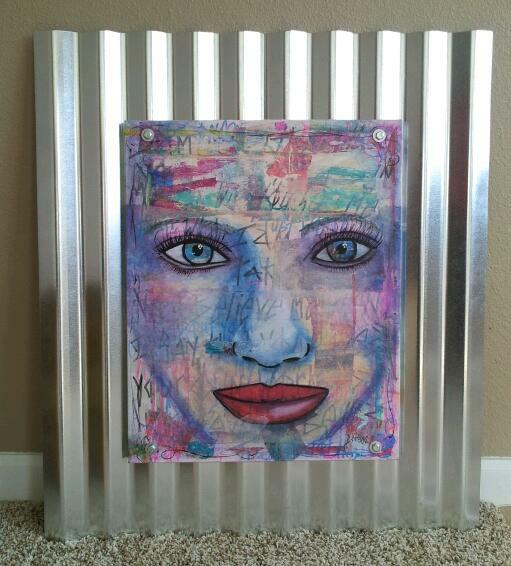 With "framing," this piece is 26"x30" and was a lot easier to pull off than I had previously thought it would be ("Ha! Easy for you to say." says my hubby who did the heavy lifting this weekend. Thank you, Babe!) We are still experimenting and considering other "framing" options. Overall though, I thought this was a great first attempt. What do you think? READY OR NOT, HERE WE GO! I AM READY FOR THIS PART OF MY LIFE TO BEGIN! Felicia, your framing is absolutely perfect! It certainly reflects the strength of your work, yet does nothing to distract from it! Way to go, indeed! Oh Felicia! It is absolutely beautiful! I love it, and am so glad you explored this option. Hubby is a champ, and bless his heart for supporting you so wonderfully! 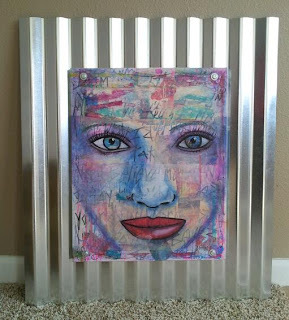 Felicia, this is such an original and fun way of framing your work, and I agree with Kay it's really strong without taking over - I really like it! Looking forward to seeing some more! Thank you all for your kind words. I have recieved mixed reactions to this style of framing. Some love it and others think its a tragedy that holes are drilled right through the canvas. I just keep saying...wait. Just wait until you see it "powder-coated" in hot pink, neon orange, teal, fire-engine red. I will have at least one piece that has bolts and corrugated metal in hot pink. Not everyone gets it and that's okay. This really is me so much more than traditional framing. And you are right, my hubby is a CHAMP!! !